Soda pop and soft drinks tickle the nose. My grandfather loved Dr. Pepper and believed the the advertisement... "It's good at 10, 2, and 4." My mom grew up on Dr. Pepper and poured it over vanilla ice cream to create a float. I've always known this Dr. Pepper float as a "black cow". So it's natural that I should love Dr. Pepper too. Unfortunately, I also love Pepsi, Coke, and Ginger Ale.. especially Vernor's. Root beer is good too, if you can get it in those frozen mugs at the drive in curb service stands with the waiters on roller skates. But Dr. Pepper is my favorite. One day I was calling a pathology report to another doctor's office. My standard phone etiquette includs identifying myself to the nurse on the other end of the line. It must have been near the end of a very long day and I was put on hold. I don't know about you, but my mind tends to wander when I'm on hold. Suddenly jerked back to reality when the nurse picked up, I said, "Hello, this is Dr. Pepper and I have a path report for Dr. Gates." At this point the nurse disintegrates ino a fit of hysterical laughter on the other end of the line and then more laughing around her and so on. Composure was eventually restored after several minutes, the report was transmitted and the call ended. I can assure you that while my last name starts with the letter P, I am NOT Dr. Pepper. I think that was the day I decided it might be best to cut down on the soft drinks. Tea has also been and still is a favorite of mine. Iced tea with lemon and sugar, or low-calorie sweetner now. In the northern states iced tea is served plain. Ask for sweet tea above the Mason-Dixon line and the waitress will look at you as if you are insane. Ask for iced tea in the South and she will smile sweetly and ask, "Would you like that sweet or unsweet, ma'am?" Of course all the "long i" sounds will be drawn out and delivered with a slow southern style and pace, and the "ma'am" might be replaced by "darlin" or "sugar". Only true Southern Belles know how to make real sweet iced tea and garnish it with lemon, orange or a sprig of spearmint. My daughter Nyssa, a true Mississippi belle, was a waitress in the little sandwich shop in our town and learned this secret. You'll just have to ask her to teach you some time. but you can't make them drink. Oh look... that doesn't seem to be a problem here. Our cats have a fountain that filters their water. They love to drink from the flowing or dripping stream. A dripping bathroom faucet draws Chloe like a magnet. I have also seen Mr. Nicky spread eagle on the toilet seat with his head stuck in the bowl but my compulsive "Get out of there!!" makes him start with the most guilty look on his face and then he runs off to hide in shame. Max, the dog likes his water in the big orange dishpan. 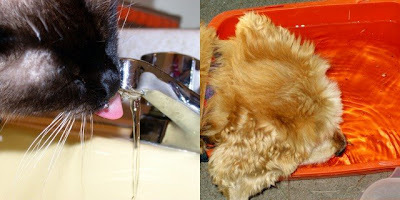 Both cats and dogs love the addition of ice cubes, not only in summer but in cooler weather as well. Max tends to eat them, crunching them up but this seems to hurt his stomach so I try to limit his ice. Nyssa in the Atlantic Ocean... landed in the "drink". Let's review. We have soft drinks and tea representing the "noun" and drinking children and animals to demonstrated the "verb" form. This last picture might seem off topic but it really isn't. One definition of the noun "drink" is a large body of water and the ocean is all that. Come summer the waters will be warm, the air hot and the sun baking; it will feel good to plunge head first and land in the "drink". The theme for Saturday Photo Scavenger Hunt this week is "drink". You can go here to "Grab the Scavenger Hunt code" and here to join the blogroll. This really cute logo is available there as well. The link to other participants is in my blogroll on the sidebar. Really, Really Old....And A Bit Scary! Who Belongs To This Tail?